Could you be the one to change history and locate the famous Kruger Millions? What are the Kruger Millions? 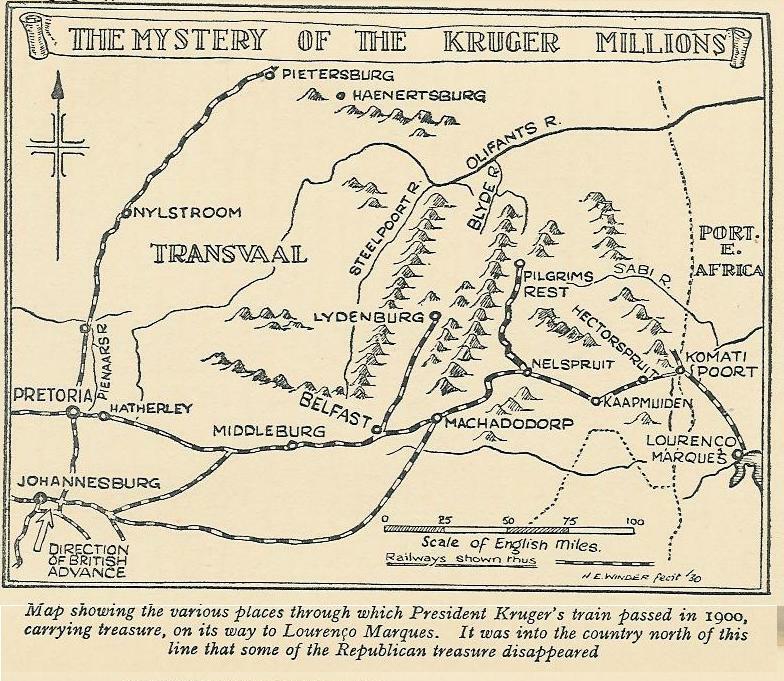 The Kruger Millions, refers to riches supposedly concealed by, or on behalf of, South African President Paul Kruger. When was the treasure hidden? Near the end of the Anglo Boar War – 1899 – 1902. Between Sept 1899 and May 1900 947 000 golden pounds were manufactured at the SA Mint to the value of R1 894 000.00. R94 342.00 in silver coins were also minted. In todays money this would equal in excess of a staggering $ 243 000 000.00!!!!! What happened to the stash? Map Drawn by H E Winder. Located in Chapter 10 of his book – The Mystery of the Kruger Millions. According to records, on 4 June 1900 the state attorney of the government took delivery of a substantial sum of gold pounds, gold bars, mint gold and fine gold which left Pretoria by train. President Kruger had left Pretoria by train a few days earlier on 2nd May,1900 and had travelled to Middelburg, for about 2 weeks. It is recorded that the State Attorney Field Marshal Jan Smuts (A later SA president) along with the Auditor general and a few other high ranking officials delivered all the gold and coins that was seized to president Kruger at Middelburg. After this stop the government train travelled on to Machadodorp then Waterval Boven and finally stopped at Hectorspruit. A witness to this journey a Mr J Kloppers (a government employee) stated that the Government carriage was indeed seen by him in 3 of the stations above. He was paid in 25% minted gold coins and 75% paper money. The President then moved on to Steenkampsberg seen again by Mr J Kloppers. He stated that he did not see any more gold pounds or un-minted coins at this location. Some well known and respected historians state that a large portion of this gold went on to Portuguese territory (Mozambique) and then was shipped to Europe but a large portion disappeared. It is reported that the Government also took the Silver coins that were minted at the time but no silver coins bearing the 1898 date have ever been seen. 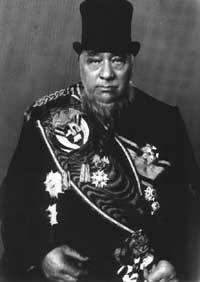 President Paul Kruger then sailed to Holland on the Gelderland on the 19th of October, 1900, while “the British poured in from all sides”. Why has the Kruger Millions Legend persisted? A big contributor was Brittish Priminister Neville Chamberlain aho at the House of Commons met old ZAR generals on 5 November 1902. They were trying to strike a deal in which Chamberlain would share the Kruger Millions with them if they could help him locate it. A statement made by a Mr John Holtzhausen on the 29th of September 1905 has also lead to the growing of this fabulous story. He was in prison in Kimberley, for stealing a horse and carriage. He was adamant that he & 2 others – Pretorius, a veld cornet, as well as a Mr Swartz, were told by the Transvaal government to bury gold & coins. He said that when he was arrested for stealing the horse and carriage, he was on route to dig up the Kruger Millions treasure which was hidden 50 miles to the north of the Blyde River and also north of Leydsdorp. Apparently Pretorius had died in the war & Swartz had been hanged for killing a man named van Niekerk. Holtzhausen was as a result the only person left alive who knew the whereabouts of the treasure. It is believed that he hid the stash to protect it from the English in his rush to leave. Historians say that he would naturally have commandeered all valuable assets and hid them in a place or places of safety. On his death President Paul Kruger wrote to the Boer people: “Look in the past for all that is good and beautiful, take that for your ideal and build on it your future”. The Kruger Millions in Modern Times. To this day people from all over the world still search for the Kruger Millions on farms and places of hiding along President Paul Krugers train route in modern day Mpumalanga South Africa. Take a look at some great finds being made here. Perhaps you could be the one to find the cave, dig the farm and strike it lucky on your quest for wealth beyond your wildest dreams. Until then the story of Kruger Millions will remain a mystery……Or will it? Kruger Millions Discovered? Buy a Metal Detector South Africa and search for yourself! Occurs when u reach out to it, believe me,bt it does exist. I have registered a treasure project company and I know I am gonna find this treasure .Yes it exists,I have enough evidence that proves the existence. Kruger Millions are so close to my heart. I hear them calling me when I sleep at night. I have seen visions and will act apon them. A fascinating reason to visit South Africa, for sure!